In what is anticipated to be a tight series between two evenly matched teams, South Africa struck the first blow as, with the aid of the DRS, Andrew Strauss was shown to be plumb LBW to Morne Morkel to the fourth ball of the innings. Thereafter, the bowling wilted. Graeme Smith went on the defensive far too early, a clear mistake given that the batsmen at the crease were Alastair Cook and Jonathan Trott, both batsmen who thrive on picking off singles. Imran Tahir looked particularly inocuous and bowled at least one poor ball per over which was duly dispatched to the boundary. Cook and Trott cruised along before a rare lapse in concentration by Trott caused him to nick behind off Morkel. Pietersen looked promising, but was strangled down the leg side, Jacques Kallis being the bowler on this occasion. None of this seemed to deter Cook, however, as more bizarrely deep-set fields allowed him to reach his century without a hint of pressure. It was a good knock which included a rare six off the near-anonymous Dale Steyn. 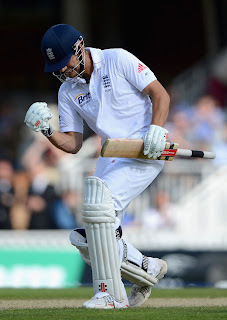 In the company of Ian Bell, Cook reached the close on 114* with England 267-3.